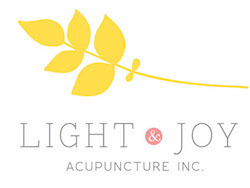 Light & Joy Acupuncture is part of an integrative practice with Chiropractic physicians and massage therapists. We are a family practice specializing in hormonal health, acute and chronic pain, stress management and chronic health conditions. Working with family before, during and after pregnancy is one of our greatest joy. As part of our treatment, we typically incorporate one or more techniques in a session - acupuncture, electric stimulation, laser acupuncture, herbal medicine (in tincture, capsule, pill or raw herb form), moxibustion, guasha (skin scraping), cupping, massage, ultrasound, infrared or mineral heat treatment. Please inform us if you have medical conditions or injuries that we should be aware of before starting treatment. For examples, diabetes, post cancer treatments (radiation/chemotherapy), post surgery and acute injury areas. Generally, our treatment runs between 45-60 minutes. Please allow 60-90 minutes for first acupuncture treatment to go over health history, consultation followed by acupuncture treatment. Wear comfortable clothing that you can pull up to knees and elbows. All treatments are by appointment only. We often work with time sensitive cases such as breech or labor during pregnancy. You could email or call our office to schedule an appointment. We have a 24-hour cancellation and reschedule policy. A $50 service charge will be assessed for missed appointments or cancellations with less than 24-hour notification. Payment is due at the time of service unless we are billing your insurance. We accept cash, personal check, credit cards (Visa/Mastercard). We take insurance with acupuncture coverage and can help you to bill your insurance. We are in-network with Cigna and Blue Shield only. All other carriers are billed out of network. provider customer service phone number.